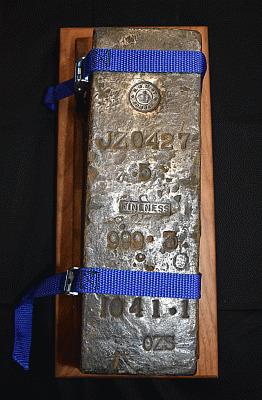 Ingot number JZ427-5, one of the 462 .999 fine ingots recovered from the wreck of the S.S. Gairsoppa circa 2012-13 by Odyssey Marine Exploration. Originally minted in Bombay, India this ingot was part of nearly 100 metric tons of silver bullion which was being transported to Britain in the winter of 1940-41 in support of the war effort. On February 17, 1941 the transport ship S.S. Gairsoppa was heading for port about 300 miles southwest of Galway, Ireland. Having broken off from its convoy due to low fuel reserves the Gairsoppa was traveling at low speed, making it easy prey for a German U-Boat. Falling victim to an enemy torpedo the ship sank 4,700 meters taking with it its cargo of silver and military supplies to the bottom of the North Atlantic. While being marked as 1,041.1 ounces the actual recovered weight is only slightly less than the original. Deeply toned and showing only mild evidence of its long period of being submerged. Accompanied by a certificate of authenticity from Odyssey Marine Exploration and a xerox file of the original insurance manifest for the cargo of the Gairsoppa. The item is available for pick up at our Irvine, California office, or we can ship via UPS Ground for U.S. residents only. Description: Ingot number JZ427-5, one of the 462 .999 fine ingots recovered from the wreck of the S.S. Gairsoppa circa 2012-13 by Odyssey Marine Exploration. Originally minted in Bombay, India this ingot was part of nearly 100 metric tons of silver bullion which was being transported to Britain in the winter of 1940-41 in support of the war effort.